The great Scottish cities of Glasgow and Edinburgh are packed with culture, history and, if you need to unwind from the hustle and bustle of city life, interesting walks to discover. Edinburgh, the capital, on the east coast, has an enthralling mix of spires and artistic excitement. Over on the west coast, the City of Glasgow, has transformed itself from an industrial power-house to a hotbed of modern culture and style. Both cities have many great walks, within their historically rich quarters, and outwith, in the hinterlands, where time ticks by at a slower pace and where you can recover from a few hectic days in the city. This walk is close to Edinburgh’s city centre, yet it feels like the country. Leave the suburb of Morningside walk alongside the river (Braid Burn), which runs through the Hermitage of Braid, and by The Hermitage, now a Visitor Centre. Further on, as you pass to the south of Blackford Hill, the river flows through a gorge. The route then climbs up the Howe Dean Path to Liberton before following the perimeter of Braid Hills golf course, with an excellent view north over Edinburgh. After a long. steady climb, the highest summit of the Braid Hills is reached. Enjoy the 360 degree views, which include the extinct volcano that is Arthur’s Seat and across the Forth to Fife. After a sudden, and steep descent, the walk finishes with a short section through Morningside, passing the Braid Hills Hotel. North Berwick Law rises to 187 metres (613 feet) behind the quaint fishing town of North Berwick al offers a panoramic view of much of East Lothian, the Scottish Borders, and across the Firth of Forth On the way to the Law is a signalling station, which was used during the Napoleonic conflicts, and an enormous beach. This route follows the main ridge of the Pentlands, the Midlothian Hills, which lie to the south of Edinburgh. It can be difficult underfoot but the scenery is breathtaking. From Flotterstone follow a minor road for 500m and bear left at a sign for Scald Hill. Continue to a bridge and access the hills, climbing to Turnhouse Hill on a well-marked track and on to Carnethy Hill. From the col between Carnethy and Scald Law, it’s possible to shorten the route (to 10km) by descending the Kirks Road to Loganlea Reservoir. Otherwise, proceed up the track to Scald Law and over the Kips. Follow the track down the Kips and around the north side of Hare Hill to the minor road at Loganlea Reservoir. This pleasant road leads easily back to the Visitor Centre. Car park is busy at weekends. This is one of the locals’ favourite, for much of its length the route follows the Greenock Cut, a 19th century aqueduct, which is a designated ancient monument. The Cut was built to provide drinking water for the inhabitants of Greenock as well as water power for its mills and foundries. Combining the Cut and the Overton track makes for a fantastic, level, circular walk with wonderful views over the Firth of Clyde, the Cowal Peninsula, and the hills beyond. From Cornalees Visitor Centre follow the Overton track south by Scroggy Bank to join the Cut by Long Dam. From there you pass waterfalls, bridges and bothies as the track contours along the hillside to Cornalees. Keep an eye out for birds of prey and foxes as well as water life in the Cut. This walk is full of beautiful scenery and is great for bird watching. From the Corn Exchange, walk, past the clock, and down John’s Loan. Follow a road past houses, and continue on a footpath by a golf course, before following a burn to Biggar Public Park. At the park gates, turn right and keep following the burn until you reach an old railway track bed. Climb over a gate to follow the track bed east, signed for Broughton. Eight kilometres further on, at a coal yard, turn left and follow a lane in to the village. Either retrace your steps back to Biggar, catch a bus or taxi, or, alternatively, you can turn right and right again at the War Memorial to follow a road, which will take you back to Biggar with some fantastic views. Each year, Edinburgh attracts thousands of visitors to the largest arts festival in the world — the Edinburgh Fringe. You can be guaranteed there will be something to interest you. And once you’ve enjoyed the plays, comedy, music, dance and physical theatre, pull on your shoes to discover the city’s green spaces. Other highlights for the city walker include Arthur’s Seat in Holyrood Park. This extinct volcano can be easily climbed in under an hour and the reward is always pleasing, albeit breezy, on the top. Fill your lungs with fresh air as you survey the city laid out below: to the left you can see Edinburgh Castle atop its dramatic crag and, to your right, are the docks and the expanding Forth estuary, or firth, with the Lothian coastline stretching into the distance. Glasgow, Scotland’s largest city, is also blessed with many fine walking areas. The city has more than 70 parks and lives up to its Gaelic name Glaschu, which means ‘green hollow’. One much loved location among Glaswegians is Pollok Country Park. Here, on the south side of the city, one can enjoy lots of marked woodland trails. Named Britain’s Best Park 2007, Pollok Country Park was gifted to the city by the Maxwell family and their impressive stately home is open to the public. Also within the park is the Burrell Collection, one of the finest art collections in Europe, which features important collections of medieval art, tapestries and English oak furniture. A good way to get a taste for the city and its notoriously friendly inhabitants is to visit when a festival is on. Try the Kirkintilloch Canal Festival in August. The festival has boat trips, live music, and arts and crafts, see www.kirkintillochcanalfestival.org. There are also Roman Heritage displays – the Forth & Clyde Canal follows a similar line to that taken by the Roman-built Antonine Wall. 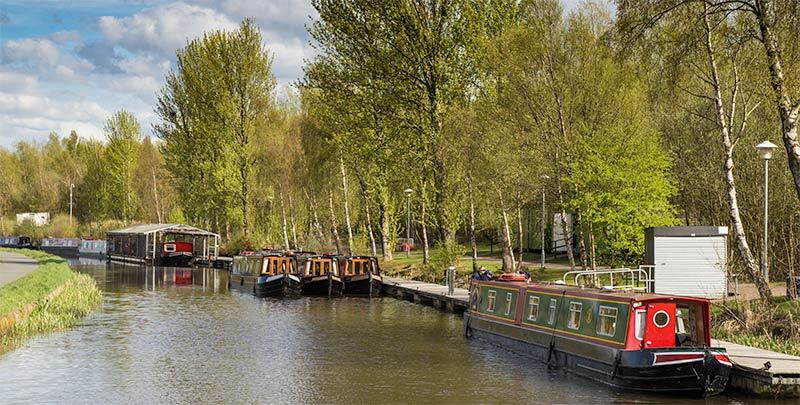 The canal towpath is great for easy stress-free walking and, from Kirkintilloch, on the north-eastern outskirts of the city, you can walk right across the country if you wish. image of Arthurs seat by alljengi, scald law by Graham Ellis. leith walkway by Lis Burke under creative commons license.